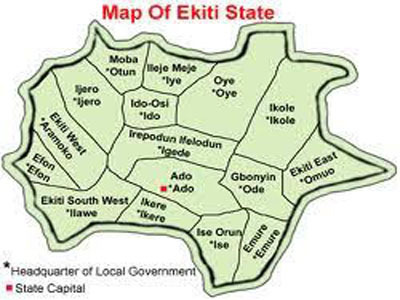 Government offices were locked in Ekiti State on Thursday as workers complied with the Labour directive to stay away from work on the first day of the nationwide warning strike. The officials of the state councils of the Nigeria Labour Congress (NLC) and Trade Union Congress (TUC) moved round to ensure compliance with the strike. The Governor’s Office, House of Assembly, High Court complex, the State Secretariat housing Ministries, Department and Agencies (MDAs) remained desolate. Private business organisations like shops, hotels, petrol stations, eateries, banks opened for business. Some of the banks that opened earlier in the day closed again at about 1.00pm when labour leaders were moving around to ensure compliance. Commercial motorcycle operators, taxi and bus drivers defied the strike order and continued their activities unabated. State TUC chairman, Mr. Odunayo Adesoye, expressed satisfaction with the level of compliance expressing optimism that workers in the informal sector would comply in subsequent days. Adesoye, who justified the strike, argued that the present minimum wage was no longer sustainable. He disclosed that the organized labour may picket offices where the strike appeared ineffective on its first day.